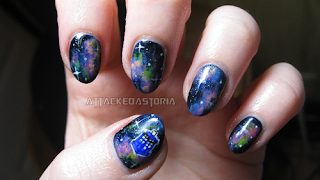 Attackedastoria Nails: All of Time and Space..
All of Time and Space.. 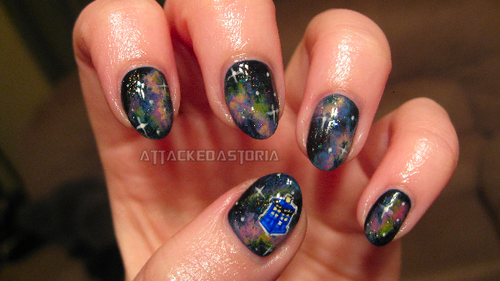 I've seen these done before, but I've been watching Doctor Who with my mum lately, so I had to give them a go.. I think she likes them more than I do, haha. Painting an itty bitty police box is no easy task, lemme tell ya.. it's also been ages since I've done nebula nails, so that was challenging. I haven't really been doing nails lately.. I've been sick for the past four weeks with something really bad. Doctor's have no idea what it is, either. Kinda scary. But I felt alright enough today, so I did these, because doing my nails helps me feel normal. Just want you guys to know, in case I'm absent for a long period, again. THAT IS AWESOMEEEEE! I love the TARDIS on there... just... wow! This is the best!